Well, the summer project is underway and this is by no means a small one. The main emphasis is on landscaping my mother-in-laws yard at the mobile home that she now lives in. Her house of near on 40 years was far too big for one person and the stint at the senior living complex was not conducive to “living” so here we are at a scaled down version of her previous home. Mobile homes have come a long way and this one at barely 10 years old has all that you could get in a regular house except “it’s mobile” you can put it on a trailer and move it to where you want. Anyway, I don’t know too much about mobile homes so I’ll get on and we’ll talk about the plans that we came up with on the yard. The first priority was she wanted a small raised planter that would give enough ground to plant tomatoes and perennial flowers. The rest would be colored pavers and rock to minimize the amount of maintenance required together with ornamental flower pots. The side of the property would be rock with strategically place pavers, flower pots and an arbor with a gate that would lead to the somewhat private back yard. This was all quickly sketched out on a piece of paper but the details would be left to me and as I have said in previous posts, providing you do have an idea the details will come as the job progresses. Over the past few weeks I have been busy working on establishing some new themes for my carvings but I have also been researching other people websites. My conclusion was that I found many Lovespoon carvings would follow a similiar theme regardless of where you look on the World Wide Web and I have looked at many websites for inspiration but I find many to be repeats of the same but with different levels of carving ability. There are many that are only carved or have relief on the front face with the back face flat or only have the corners taken off to give some dimension. These Lovespoons I felt would look often mass produced but the prices are so reasonable that it would be very easy for the enthusiast to start a collection but is this a course that I would want to take. For me to try and establish myself as a carver of some sort, especially with Welsh Lovespoons most of the carvings that I make end up on eBay for auction and it is there that I try to gauge the feeling of how the design is perceived. The amount of traffic or should I say small amount of traffic for this sort of carving is primarily from enthusiasts who are looking for a bargain and will frequently stop by. If the design is a success I would find six to eight watchers over the course of the auction and maybe six to eight bids at the end of the day, giving me a good sense of achievement. I like to think it is the quality of the carving and the unique design that sells the item and not purely the price but as we all know eBay is the site for bargains. When I first started this type of carving I decided that both sides would have to have the same amount of detail so that the Lovespoon could be handled and not just be displayed on a board. It is only when it is handled that the true appreciation for the craftsmanship can be determined and the fact that it is hand carved, saying that it also brings the flaws closer to hand. With Spring just around the corner the natural course for me would be to design a Lovespoon that represents those small details that we associate with that special time of year. The blossoming of the trees, birds vying for a mate and ourselves becoming more romantic on a daily basis. This Valentine’s day just past was the beginning as couples try to break from that wintery grip so what better than to share my thoughts on what I should carve. 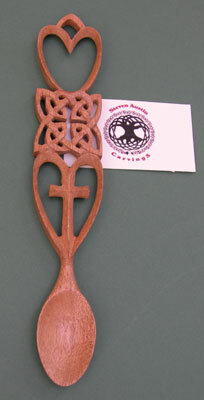 As you have probably noticed during the course of reading my Welsh Lovespoon carvings, almost all have been made what I call normal size, that is, six inches or larger but recently I have had several enquiries as to whether I make wedding favor size lovespoons. Of course most of these emails are from people who have seen items that I have been selling on eBay and are genuinely interested in the carvings that I do and that is as far as it goes but after reading one particular email it first sent me into a panic. This was a firm enquiry about making Wedding Favor Lovespoons. 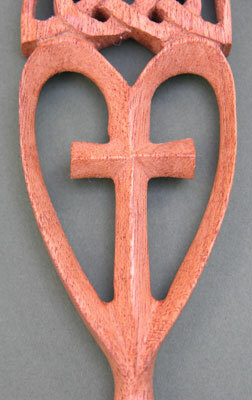 With the detailing of the heart and cross complete I am now ready to tackle the main feature of the Lovespoon, the emblem of the Priory of Sion. This is unique enough to be one of the focal points of this carving and the most intricate to get the detailing to stand out so while I have been carving the rest of the Lovespoon I have been thinking about the best way to approach this stage, which for me is an ideal approach. I can slowly work the details that I already know how I want them and casually work out the other details in the mean time. In the previous post I had talked about and worked out all the element placement and now I’m at the stage where I have attached the sketch to the wooden blank. In this particular instance I’m going to use birch as the wood of choice as it has the elasticity to absorb the constant pressure of carving in delicate areas without cracking. I know it will not be the easiest wood to carve as it tends to have a pliable feel when carving, in contrast to that crisp feel of cutting mahogany or maple. With birch it always seems to have a little resistance before the shaving starts to curl off the carving tool regardless of how sharp the blade is. It gives the impression that the tool is dull and you’re constantly checking for sharpness. The first task in the development of any of my Lovespoons is to drill small pilot holes in all of the tight corners. This one procedure eliminates a lot of mishaps with the bandsaw, it reduces the chance of cutting into delicate parts of the design and adds a clean finish to the corners. For this design I used a couple of different size drill bits depending on the complexity of the area. For the heart I only needed a few holes so that the fret saw could be easily maneuvered around the inside of the shape, in contrast the rose needed many small holes to define the corners and present an easy way of controlling the fret saw. As you can see from the design I have decided to remove material from both the inside of the heart and the inside of the cross making for a light delicate theme throughout. The spoon bowl has also been extended and like I said previously, by leaving these areas open it gave me the option to revisit them as the design formulated in my mind. With all the pilot holes drilled, the next stage is to cut out the inner shape with a fret saw, for me I use a hand fret saw. The ease with which you can transfer from one area to the next is far easier than releasing the blade on a power fret saw and trying to relock without the blade snapping more than once during the course of cutting out the shape. I will leave the outside intact until I have cut the inner shape first and by doing this it will eliminate crushing the delicate edges of the design and provide a sturdy grip in the vise. The one drawback from hand cutting is trying to keep the blade square to the line, this would be a problem if the carving was going to be one sided but in my case I always shape the back face as well. In one sided carving you would want the hole to be square through so that you would get the full benefit of the shape whereas I can resolve any issues when I shape the back face. The best way for a square edge in this case would be to use a power fret saw. While reading the Da Vinci Code novel by Dan Brown this summer I was thoroughly intrigued by the many layers that were going on at the same time together with the various elements that came into play and being curious I decided to take the time to research the internet to see if any references could be made to any of these particular instances. I knew that this novel had caused a stir amongst the religious sectors due to speculations and misrepresentations said to be portrayed throughout this novel but the impression was enough to seek further reading. I had a notion that I could design a unique Lovespoon around some of these elements and I started off by first visiting the Wikipedia with a reference to the Priory of Sion. It was there that I found the official emblem of the Priory of Sion which incorporated a fleur-de-lis, intricate enough to make a great focal point for the start of my Lovespoon design. The annual My Dog’s Face Contest has kicked off today in the Orange County Register and we thought why not submit Murphy our thirteen month old Newfoundland puppy. This little guy at 110lbs will slobber you like no tomorrow being the lean all swimming machine that he is. Visiting the dog beach at Huntington Beach with bumper in tow, that is the small type that floats and not the item that protects your vehicle, he will crash into the surf to retrieve it for hours on end. The only time he relaxes is to take a drink or visit with some passing canine that takes his fancy, then the fun begins with a race up the beach.